Back in 2008, MG Commercial Real Estate was the first client project I was able to complete from start to finish as part of Envision Technology Advisors. When I had to chance to update the website with a design realignment and a move into ExpressonEngine in 2012, I jumped at the chance. Similar to the 2008 redesign I did, MG Commercial wanted something classy and sleek – a very upscale look for their website. Rather than do a complete redesign and start from scratch, I allowed this update to really build on the previous design as a logical progression in the site's history. The black and white scheme was left intact, with red used as an accent and hover color. The biggest change on the site was the move to the ExpressionEngine content management system to allow them to have more control over their site's updates. Like the previous version of the site, the property listings section is powered by a third party company called LoopLink. 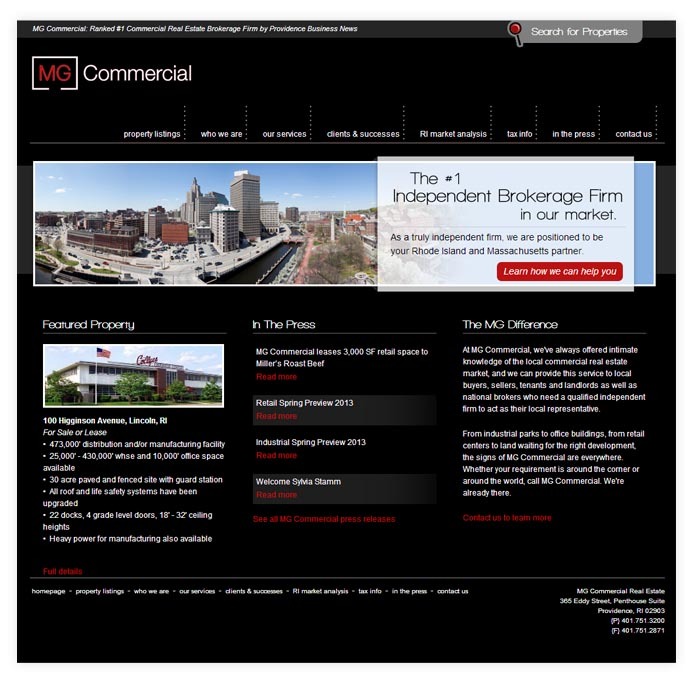 You can visit the new MG Commercial site at www.mgcommercial.com.